For her latest feature, following 2008's Oscar winner The Hurt Locker and 2012's Zero Dark Thirty, visionary director Kathryn Bigelow takes us to a different war-zone altogether, the 1967 Detroit riots. While it lacks the nerve-racking tension of the Iraq-set The Hurt Locker and the engrossing detail of the hunt for, capture and execution of Osama bin Laden in Zero Dark Thirty, Detroit lays bare police brutality and civil unrest with all the discomfort of a well-made horror movie, as the paths of various characters caught up in the chaos sweeping the city lead to the Algiers Motel, where many are about to experience the most traumatic experience of their lives, and for some, the last experience they will ever have. Bigelow attempts to contextualise the central incident by depicting the roots of the rioting: An illegal blind pig in a black Detroit community is raided by predominantly white police, who take an unnecessarily heavy-handed approach to rounding up the bar's inhabitants. A small crowd quickly starts to gather outside, and soon enough the police are being driven out of the area, and neighbourhood shops are being destroyed and looted. Both the Army and National Guard are brought in to bring the troubles under control, while Detroit police hunt down any looters hoping to go unnoticed in the crowds. It's a good thirty minutes before we reach the Motel, and this time is spent establishing the various characters who will become major players later on. These characters are painted in broad strokes, but it's effective enough in establishing the kind of world they inhibit, and why they have good reason to fear the sight of a policeman, innocent or not. At the film's heart is Melvin Dismukes (John Boyega), a security guard caught somewhere in between two worlds. He is a figure of authority and takes his job incredibly seriously, but he's also black in an institution made up of mainly white folks, so he finds himself also having to toe the line when dealing with officers clearly harbouring racist feelings. There's also Larry Reed (Algee Smith), the lead singer of R&B group The Dramatics, whose big-break concert is cancelled because of the riots. Larry takes his friend Fred Temple (Jacob Latimore) to the Algiers Motel to lay low while the riots calm down, and the two pass the time by chatting to two girls (played by Hannah Murray and Kaitlyn Dever). The girls are actually prostitutes, and the group wind up caught up in a prank involving firing a blank-shooting starter pistol at the police through the window. Believing to be under attack from a sniper, the police and National Guard storm the Motel and begin a night of humiliation and terror for those simply caught in the wrong place at the wrong time. At the Motel, cop and baby-faced bigot Krauss (Will Poulter) starts to systematically strip away the humanity of the residents, using everything from intimidation, violence and mind-games to find the lethal weapon that doesn't exist. Flanked by Ben O'Toole and Jack Reynor, Poulter is magnificent, digging deep to somehow find a shred of humanity in a character so inherently evil. As is Boyega, who manages to hit you with a gut-punch during the final act as the seriousness of the situation - and his role in it - suddenly overwhelms him. The film goes on to detail the immediate aftermath and the subsequent trial of the three police officers, bringing in an unnerving slimy John Krasinski as the defence. 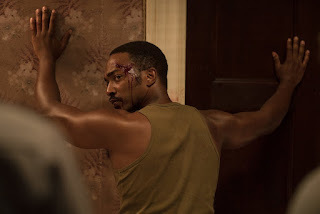 At just shy of two and a half hours, Detroit feels overlong despite Bigelow's best efforts to keep the film moving at a pace. The final half hour could have been wrapped up in text, but it does pay testament to the survivors, some of whom were left with mental scars from which they would never fully recover. Detroit's real power stems from the harrowing, maddening centrepiece at the Algiers, a terrible abuse of power not terribly different from some of the news stories we still hear about today.